Heat oven to broil. Lay tomatillos, peppers and garlic on a rimmed baking sheet. 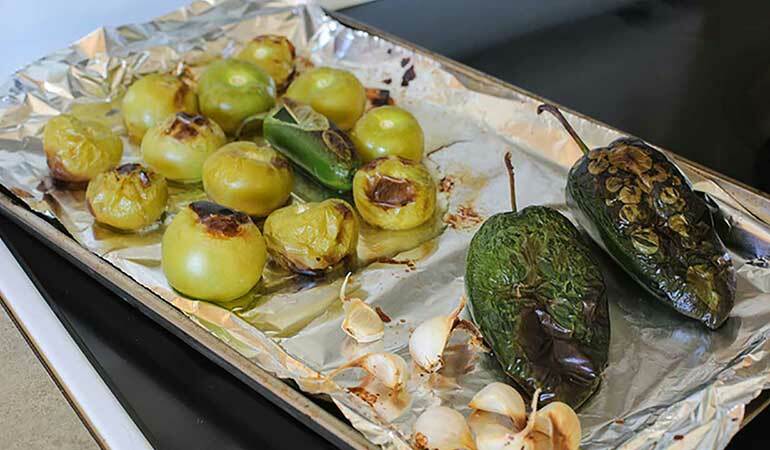 Place baking sheet on the top or second-to-top rack in the oven, and broil until charred and blotchy all over, rotating tomatillos, peppers and garlic occasionally. This may take 10-20 minutes. Once charred, move ingredients to a bowl, cover with plastic wrap, and allow the bowl to sit on the counter for 10 minutes. This will create steam, which will help the skins release. After, scrape the skin off poblanos and jalapeños and remove seeds. Peel garlic and remove parts of the tomatillos that have become hard and chewy. 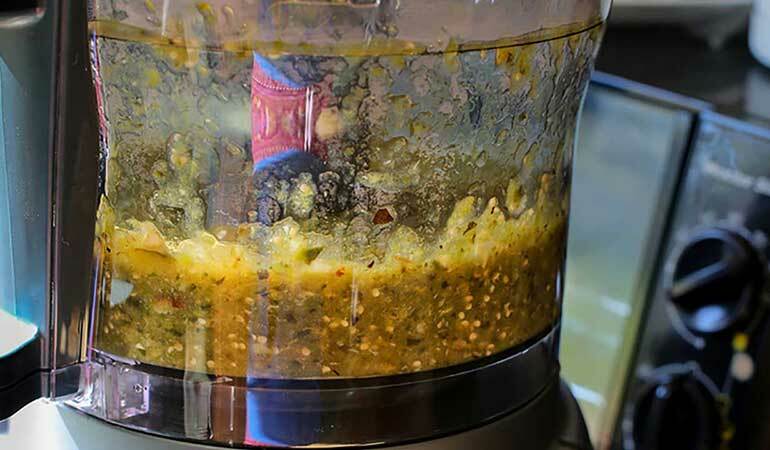 Place tomatillos, jalapeños and garlic in a food processor, including leftover juice, and pulse until smooth. Set aside. To make chili, heat olive oil in a medium pot over medium-high heat. Add ground turkey with a pinch of salt, chili powder, coriander, and cumin. Brown meat until cooked through, breaking up meat with a wooden spoon. Next, add chopped onion and sweat for 5-7 minutes, stirring frequently. Then add the green salsa and mix for 2 minutes. Add chicken stock, great northern beans (plus juice) and bay leaf to the pot. Bring to a boil and then lower heat to simmer for 1 ½ to 2 hours, stirring occasionally. Add Lawry’s season salt to taste. Serve with freshly chopped cilantro, shredded cheese and your favorite crackers or corn muffins. If you shoot a turkey this season, grind it and surprise your family and friends with this zesty, spicy green chili. 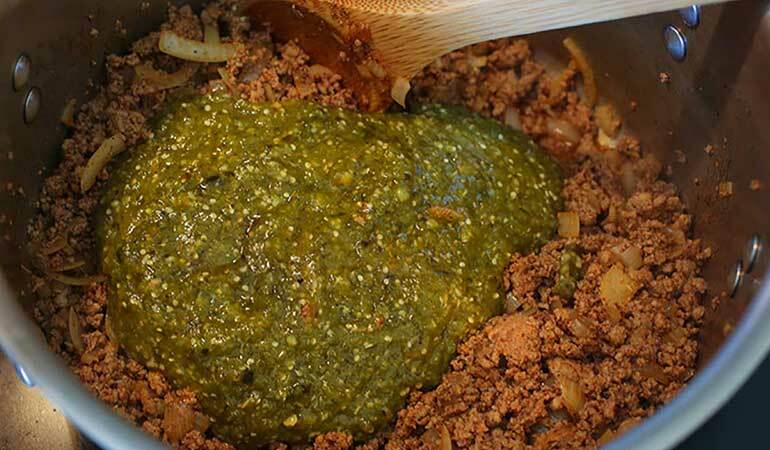 There are a couple more steps compared to traditional red chili, but it’s fairly simple to make salsa verde and the end results are well worth it. 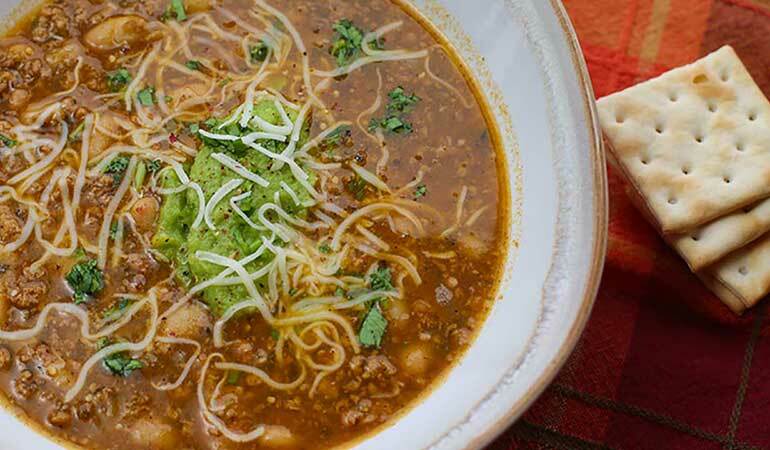 Just as hearty and filling as the chili you know and love, the tomatillos in this chili provide a bright, more delicate base for the mild flavor of turkey to come through. Tender, buttery great northern beans will melt in your mouth, while healthy, nutritious smashed avocados add a touch of creaminess. If you don’t have the time, you can also buy prepared salsa verde sold in jars.